Snow Days- Make a language-based snowflake! Snow Days is a simple and elegant interactive from Popular Front, a web-based media company. Although 362 days of the year, I want nothing to do with snow, kids sure like it. 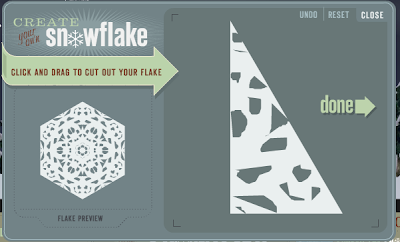 This site provides a user-friendly way to make a snowflake, and you don't have to sweep up afterward. The click-and-drag interface lets you make a geometric or irregular design, add a "message," then let the snow fly! You can use your snowflake's number or other features to find it later. In the course of my inspection, a lot of users had not added a message, and all who did kept it clean. Try it out while it's timely. Maybe this would be a good change-of-seasons activity. The design process and snowflake showcase lend itself to using mathematical language and concepts, such as shape names, counting or more complex ideas such as center/perimeter. The message is a great little web publication opportunity (very motivating) and could be used for a language target. "When winter is over I will..." or "I will miss the snow because..."
Locating peers' snowflakes provide a pragmatic context for commenting/complimenting, etc. 1. If you were to write a headline for this topic or issue right now that captured the most important aspect that should be remembered, what would that headline be?" Thinking Routines are great discussion structures when you are working at the discourse level with students. The prompts in each routine are often related to the classic "main idea and details" type of goal, but also move students toward higher level thinking. The elements within each routine generally link together in ways that foster complex sentence formulation skills. 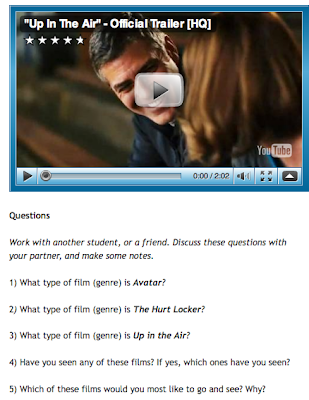 Much of the site lends itself to response to wh-questions, but also use of more advanced comprehension strategies such as connections, questioning, summarizing, etc. The video clips and other resources are in story or information form, and would be great contexts to explore story mapping and expository text structures. Both PowerPoint and Google Docs can be used to organize information graphically as a pre-writing activity, with students creating the writing spaces as they generate the ideas (rather than using a pre-made organizer). Previously I highlighted the use of PowerPoint to make defined graphic organizers for students. The as-you-write approach is recommended in expository writing programs such as EmPOWER. Google Docs provides an entire free suite of tools similar to MS Office, and can be used in much the same way. With your Gmail account, you can access the document creation interface, which works quite intuitively. 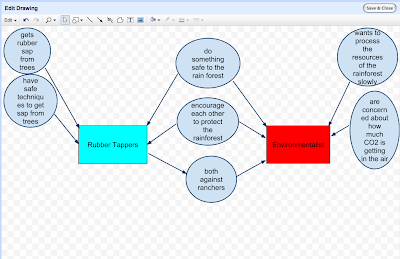 Several social studies teachers I am working with are implementing EmPOWER techniques in their classroom as their students use Google Docs to write out their positions on various ecological issues, eventually culminating in a "Rainforest Conference." For prewriting, the students can create the EmPOWER BrainFrames in a Google Document (Create New>Document>Insert>Drawing). The tool and some student work -a compare/contrast frame- are shown below. Students internalizing and generating a structure for organizing their language- what's better than that? Thanks to 6th grade teachers Megan Flaherty, Peter Spiegel, and Susan Levy for showing me how you are incorporating EmPOWER in your classrooms. Creation of graphic organizers helps students to break down lengthy language or text into chunks they can understand, and see connections between their own ideas in pre-writing/pre-speaking activities. Alignment with expository text structures (e.g. sequencing, compare/contrast) promotes generalization and recognition/use of these structures in other contexts. Often times we require a graphic organizer to help our students with a particular task (comprehension, pre-writing, etc), and the perfect one just isn't in our library. Usually, actually. PowerPoint gives us the tools not only to create presentations, but also do some simple (or advanced) page designs to make customized graphic organizers. Just open a new presentation, orient your page (File>Page Setup) and go to work with the drawing toolbar (View>Toolbars>Drawing). The toolbar allows you to add all sorts of lines, boxes/shapes, text, arrows, and colors to create spaces for students to brainstorm or break down ideas. Your graphic organizer can then be printed or shared with the student on the computer. The possibilities are really limitless. 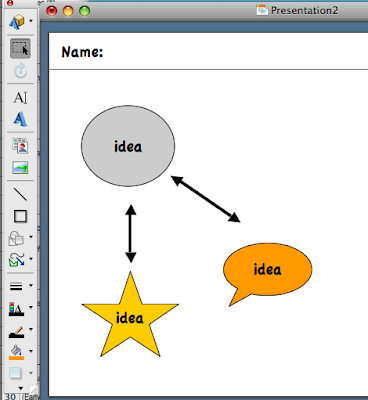 Here is an example of a set of graphic organizers I made with PowerPoint (click on Download). These are based on a presentation on language schema made by Sarah Ward, a Massachusetts-based expert in executive functioning. You should catch her at ASHA or elsewhere if you can- she is an excellent presenter. Graphic organizers provide a visual representation and break down information. Using a graphic organizer can be a goal in itself, or a strategy for comprehension, pre-writing, problem solving or tracking steps. Dunkin' Donuts has a great new interactive celebrating their 60th Birthday- Create Dunkin's Next Donut Contest. The website allows you to choose a donut shell, kind of dough, fillings, frosting and toppings. When it is complete, you can submit your creation to Dunkin' and be eligible to win $12,000 (though you might want to use your judgment on that step in the educational setting, especially since it requires an email). I used this activity with some teens in a social skills group and they found it very cool; with its ease of use it is appropriate for all ages. This site works best if you have updated to the latest version of your browser, and you may need to install the latest Flash player. You may want to have a few computers, laptops or netbooks available if you are using the activity with multiple students, but this is not necessary. When the donut is complete, it would be a good idea to take a screen shot of it (apple/command-shift-4, then click and drag across the picture on a Mac) for later use. It's a little more complicated on PCs, but here are some directions for Windows XP, Vista, and Windows 7. The interface lends itself to all sorts of language goals. In using it with a social pragmatics group, it functioned as an icebreaker and discussion starter. For younger students, it could be used for simple requesting and description activity (colors, etc). This could lend itself to a barrier game, with one student sitting with the laptop and the screen functioning as a barrier to the other student, who describes/requests a specific kind of donut. With upper elementary or older students, a pre-activity could involve a discussion of donuts and their similarities and differences. This could lead to a kind of "schema" of donuts, creation of a graphic organizer, and a descriptive writing activity (perhaps coupled with a screenshot) about the completed donut. Development of descriptive schema is helpful for all students with verbal organization difficulties. 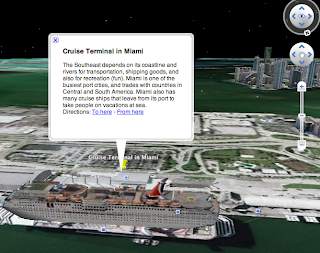 Using the GE tours would provide students with a visual context to review and describe curriculum content. Landmarks are categorized by region and would lend themselves to being reviewed in conjunction with listing or describing graphic organizers (such as those contained in MindWing's Thememaker). 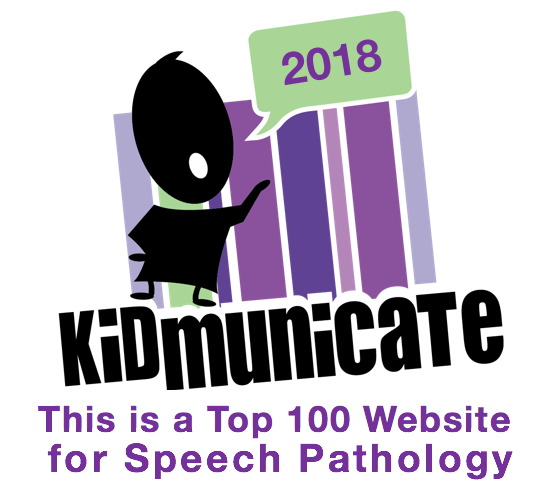 Review of placemark text can provide a context for listening and comprehension strategies (visualization, connection, questioning, etc) and response to wh-questions.